Meet Robyn from slightlymorethanateaspoon who caught my eye this week with great post on super market induced emotional breakdowns. This was one of those blogs where the more you look around, the more you like the writer. Robyn is honest with more than a teaspoon of courage as she talks about the challenges of being a mum to ‘two-under-two’, having a husband who seems to work way to hard and her failings at all things craft. Robyn is not afraid to write how she feels as she battles a few of her demons – if you haven’t already checked her out (I tend to always be late to these parties) get to her blog. Robyn is also on Facebook and twitter. So this may be the most pointless award I give out because a) you are all very aware of the recipient (how else would you be here) and b) it’s pretty much the biggest piece of “stating the obvious” I’ve done so far (and I am goooooood at stating the obvious!). Yip the winner of my Just-plain-awesome award is Grace. Grace also gets the community service award for her Flog Your blog Friday (she does actually read all 100 posts), the not-afraid-to-vlog-with-silly-hats award, the gave-me-my-first-guest-post award and the top-bird-that-take-an-interest-in-my-blog award. Grace – well done. Consider this a big thanks from me, a virtual pat on the bum as we walk off the pitch, a cheeky beer bought and tiny first repayment on the blogging karma you’ve earned. Obviously you all know about Grace’s withsomegrace blog, but she is also on Facebook, twitter and youtube. Check her out. Keep an eye out this weekend as a very special guest will be posting on the Illiterate Infant. I’ll be getting out the best china and the posh loose leaf tea at the back of the cupboard. Any guesses? This entry was posted in Being a Dad, Caught my eye and tagged feminism, Privacy, womens media. Bookmark the permalink. Dude! (Can I call you that??!) I’m blushing! And I don’t blush easily! And YAY to Grace! All awards are good! I love that you gave Grace an award – she totally deserves one! I only just discovered Robyn from Slightly Deeper than a Teaspoon last week. Agreed. Awesome. Enjoy your last few weeks. Yes, I love Robyn’s blog. And I agree with you about Women’s Day magazines…awful. They are just full of bitchiness and nastiness. Did you read Eden Riley’s post about the Chrissie Swan saga? I thought she said it all very well. And yes, Grace deserves the award. She’s very awesome, and so generous to us all. I’m totally with ya on the Woman’s Day thing. When I was young and stupid (as opposed to now being older and still stupid!) I used to buy them every couple of weeks when I’d finished a book on the train to work and didn’t have another one to start for the train trip home. So I’d buy three magazines (because even three wasn’t enough for the stupidly long train-trip back to the sticks) and slowly work my way through them. If only I’d had things like smart phones and Kindles and iPad’s back then, it would have made life so much easier! Now I buy the occasional Who Weekly, but only if there is nothing on the cover about the latest celebrity bodies and I’ve had a particularly shiteous day/week and need to fry my brain for half an hour on mindless dribble, looking at colourful pictures! I have been an infrequent reader of Robyn’s blog so your post has reminded me it’s time to stop in again. And of course, Grace. Honestly I’m surprised it’s taken you this long to give her due recognition on this here blog of yours. Shame Kev, shame. I really have nothing intelligent to add this week Kevin as I agree with you on the crap magazine front (can’t stand them and refuse to buy them) and your shout outs for Robyn and Grace are well deserved. Good luck surviving Mrs II’s nesting urges over the next few weeks! Grace is just amazing! 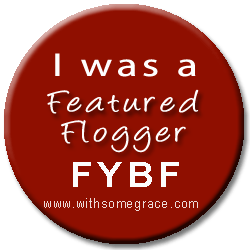 What she does in the blogging word is absolutely great! Good observation – re magazines – I’m in the minority but you won’t find a women’s mag in my house, unless my husband has snuck one it – it’s all crap. Hope your wife is going well, the countdown certainly is on. As for Grace, she rocks for shizzle!